Recently I have been getting classic Disney films on netflix and watching them in order of release date. It is a fascinating exercise. I just finished Bambi and one of the things that stuck out to me is how dark the films all are. All of them have near-deaths or deaths and are painted with a somewhat somber tone. This is interesting because you would think the last thing audiences in the 30s would want is a sad picture? Perhaps there was something cathartic about going to the cinema and seeing animated characters persevere through tough times? For example, Pinocchio, Dumbo and Bambi are basically all about orphans. There is also a very clear distinction between right and wrong. In Pinocchio you are either lying or telling the truth, no in-between half nose growth! In Bambi there is the menace of mankind that is always bad. There are no friendly humans. There is just evil and good, and the evil destroys the family. Interesting. Snow White is perhaps the most commercial of the early pieces but it still has some unusual touches. Just as Pinocchio, Dumbo and Bambi are all abandoned by their mothers, Snow White is left with no mother but one that wishes to kill her. I wonder if this is saying the people in the 30’s felt an extra need for the comfort of a mother’s nurturing, that somehow there was a void of this type of nurturing in darkness of the Great Depression? Perhaps there were groups who wished they could fall asleep until true love saved them. I can see how that would be a very appealing notion. Also the dwarfs with their hard working, mining, singing ‘hi, ho’ must have been easy for a depression-era audience to relate to. The idea of ‘whistle while you work’, a terrific notion for those that often did not have work. Its fascinating that Disney did not produce another princess movie after Snow White until Cinderella in 1950. Instead they proceeded to release one artistic, risky venture after another, with none of them having the same easy schtick as a Dopey or Doc in Snow White. (They did not learn that lesson in the 90s with the ever wearisome sidekicks that muddled pictures like Pocahontas). From all I can tell Walt Disney was a true artist as well as an entrepreneur and was not satisfied to make mere money but wanted beauty also. Dumbo is particularly interesting especially when you consider it was released the week of Pearl Harbor. As a modern viewer it feels very sad but it was looked at as the time as a hopeful piece. The New York Times described it as the “most genial, the most endearing, the most completely precious cartoon feature film ever to emerge from the magical brushes of Walt Disney’s wonder-working artists!”. Strange how the tone in pieces can change when it is viewed in different eras? I think Dumbo was hopeful because it was about someone facing insurmountable odds and becoming a star. It is a very simple story and not much happens but someone who is different finds acceptance and success. The speech by Timothy Q Mouse to the crows must have been especially moving to a nation at war, facing a bully. Its like Disney was talking directly to the Pearl Harbor bombers and Hitler in Europe. Dumbo, like other early films, is an artistic achievement. Painted on watercolors it has a surrealist quality that is not found in any other Disney film. Bambi is gorgeous using layered backgrounds and the most realistic animals that had ever been drawn (look at the difference between Snow White in 37 and Bambi and 42 and the animals are quite astounding). Both Bambi and especially Fantasia were light on dialogue and heavy on music but as visual paintings they work. In Fantasia they create whole ballets to classic music. As a child I grew frustrated with Fantasia because of its lack of plot but as an adult I can appreciate it as the work of art it was intended to be. It is remarkable to think that enough kids were interested in classical music to even justify beginning such a project. You could never get a new movie like that made today (I know there is Fantasia 2000 but that was geared mainly to adults nostalgic for the original.). Disney’s boldness in choice of subject, character and tone is especially interesting when you think of the small window of influence the films had. There was no Disneyland, no large-scale product merchandising. The film was it. If it did not do well there were no DVD sales to back it up or large over-seas markets (especially pre WWII). So the fact they would pick such bold and unorthodox pieces to work on is truly remarkable. The only Disney classic that I must own to not caring for is Pinocchio. I found it terrifying as a child, especially the part where the kids turn into donkeys. Not that I was a lying child but its a pretty grim, scary scene! Still, watching it as an adult I enjoyed the artistry and risk that such a film took. The depth of the drawings and level of details are amazing. Also, the scenes inside the whale, while beautiful, are terrifying for a little girl! I do love When You Wish Upon a Star. One of my favorite Disney songs ever. I think such a song must have wrung true for the generation of 1940 with war, poverty and despair, a lot of wishing and hoping must have occurred daily. In a world where we face some of these same challenges perhaps it worth while to view what uplifted them and see if it can do the same for us now? At the very least its been an entertaining and enriching experience. I highly recommend it! Bambi and Dumbo go into the vault (such an obnoxious advertising technique by Disney) soon so act now while you have the chance. What classic Disney do you like? Do you view them differently now than as a child? What is your favorite all-time Disney movie? Do you think we’ve lost something with the death of hand-held animation (I do)? wow. That was a well written blog post with some really good thoughts. I too am a big fan of Disney movies, my wife and I went on our first date to see Hunchback. We also live in Kissimmee Florida now, 30 min from Disney World, both of us from the north east originally. My favorite Disney movie is Little Mermaid, I know.. big guy like me loves the mermaid? The music is awesome and Sebastian is just the best. My wife’s favorite is Robin Hood, a real classic Disney movie. Thanks for sharing your thoughts, now I need to go watch Little Mermaid tonight and sing out “Kiss the girl” in my best Jamaican accent, which is not that good. Thank you for saying that about my writing. I’m excited to be a writing buddy with you for nanowrimo. This is going to be fun! 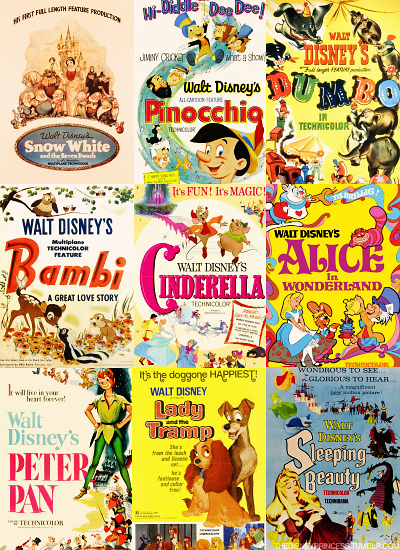 What’s your favorite classic Disney? I watched them in chronological order of their release and it was fascinating. The thing that interested me most was how bold and adult they seemed. Walt was definitely not pandering to kids. Love that. Looking forward to NaNo, and seeing how your book comes out. For classic Disney I lean toward Fantasia, but still an older film, just not that old, I love the Black Cauldron. A very dark cartoon, but has a great story to it. It is a monster 800+ page bio that covers his entire life. Shows you how hard Walt worked for what he had and how Roy Disney saved his behind more times than can be counted. Walt is an amazing person that has done more for America, and the world, than a lot of other people who get more credit. I really thought about getting that book when I went to Disneyland. They have it on audible. So you liked it? I love Disney. He was so bold in every way. I like bold people.